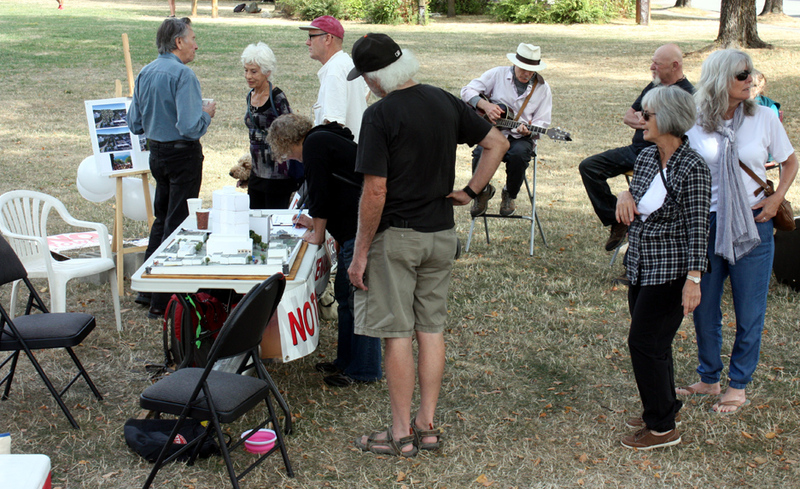 The NO TOWER Coalition is actively campaigning against a proposed tower at the corner of Commercial and Venables in the Grandview-Woodland neighbourhood of Vancouver. As a means of obtaining massive density and height approval, the Developer, Boffo Properties, has partnered with the Kettle Society, which provides services for the mentally ill. The proposal is entirely out of scope with the surrounding community. This approach is not community building. It is community destruction. We have gathered over 2,000 signatures on our petition against the project, and opposition is growing. We call on those involved to abandon the idea and go back to the drawing board with a low-rise option for Kettle expansion, in keeping with the character of our neighbourhood. Boffo’s massive tower proposal would be very destructive to the people-friendly ambience and streetscape of Commercial Drive. Keep the Drive under five! An alternative low-rise proposal for the Kettle, which DOES NOT include a tower, must be fully explored. The Kettle has obtained city, provincial and foundation funding for their other real estate ventures in the past. We suggest those same funding bodies should come to the table in this instance. This proposal is being characterized as “affordable housing” (D. Boffo, Vancouver Province July 10, 2015). This is FALSE. The 150 to 200 high-end market condos in the proposed tower would NOT be “affordable”. There would be a possible 30 units of housing for Kettle clients, but not for other low-income or homeless citizens. Just how long would these units be retained as supportive housing? They could be converted back to market units at some point in the future. We do not know. If approved, the 150 to 200 new market-priced condos would add massive and unnecessary density to the neighbourhood, with associated congestion, parking and transportation problems. Grandview-Woodland is already one of the most densely populated neighbourhoods in Vancouver. The Grandview-Woodland Area Council is concerned that existing affordable rental stock will be lost as up zoning for towers in our neighbourhood increases. We agree. This tower proposal is part of that destructive trend and should be blocked. The addition of increased space for the Kettle is being characterized as a public “good” provided by the developer. It has also been characterized as “a public amenity contribution”. Both assertions are false. The developer’s main motive is profit, not community wellbeing. Partnering with a community group is a manipulative way to buy support for a destructive proposal. As partners in the development, the Kettle would receive space for mental health services, which is NOT a public amenity. Services for people with mental illness should be publicly funded. The Kettle must seek alternative options. Relying on developers to provide public services, in exchange for highly profitable height and density bonuses is a dangerous trend and must NOT be allowed. It is likely city staff have held numerous meetings with the developer on this proposal. Yet a recent city open house on the matter, made absolutely no mention of the specific Boffo proposal. There were no models or proposed drawings. Why not? This is NOT an open and transparent approach to community planning. We call on the city to come forward and discuss this specific proposal with the community now, to hear our concerns, and to explore low-rise alternatives before making any decisions. Meanwhile, the developer is being unclear about the proposal. Daniel Boffo has referenced a tower with a possible twelve storeys, fifteen storeys, and even twenty storeys. Sometimes he refers to “150” condos. Other times he says “150 to 200”. This is a manipulative game designed to keep the community guessing. Recent drawings of the proposal created by the developer’s architect, are being widely circulated. But the drawings are also described as “for general direction only”. They do not represent a final plan. With views only from above, the developers’ drawings never show the true height, mass and scale of the proposed tower. There is no “elevation view” at ground level, to show the real height of 15 or 20 storeys in perspective. This is dishonest and misleading in the extreme. The nearby Lions building is shown in these drawings as 14 storeys. In fact it is only 12 storeys, is well set back from the street and comprises 100 per cent subsidized rental housing for low-income seniors. This Lions building has a 2.2 floor space ratio (“FSR” is used to calculate interior density.) The proposed tower would have an FSR of 6.8 according to Daniel Boffo. This is more than three times as dense. We call on Boffo Properties to come forward and openly discuss their exact plans with the community. Recently the City of Vancouver made a new request to the province to come to the table and partner with the city for affordable housing. The city proposes to offer some of its land holdings to be used along with possible provincial funds. We support this call by the city. This very solution could be used at Commercial and Venables where there is a city-owned parking lot. The Kettle already owns its own building on the site. A collaborative approach with the city could produce a low-rise option for the Kettle that would not include a private developer. THERE ARE OTHER OPTIONS TO BE EXPLORED! City owned land should not be sold outright to developers for luxury high-rise condominiums. 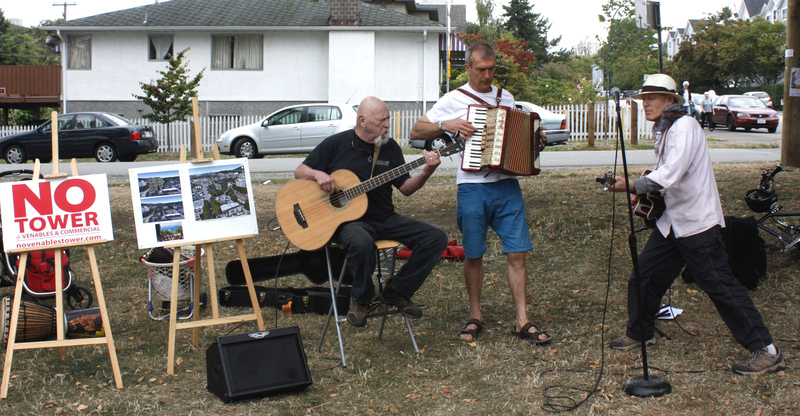 This city land is a community resource and should only be used for community good. Posted in Statements on August 21, 2015 by pennystreet546. 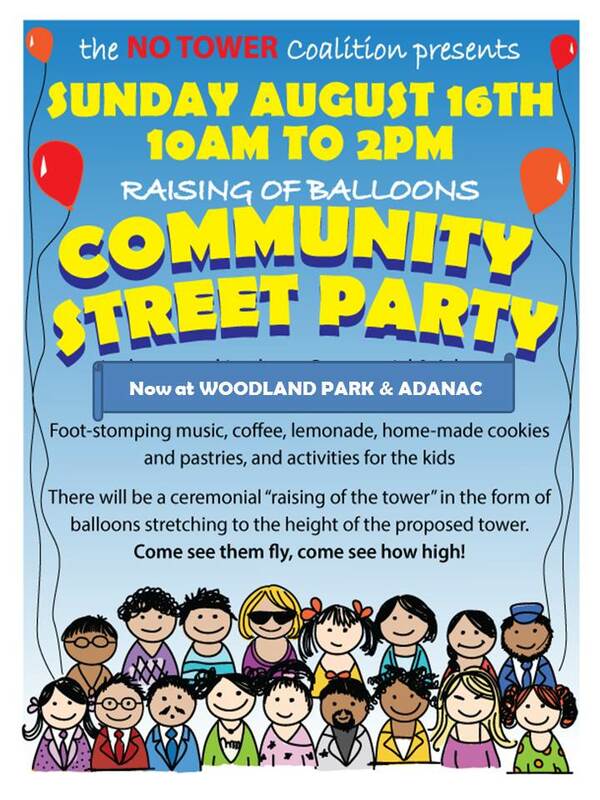 Our community balloon lift-off and street party at Woodland Park was a big hit today. There was a decent media turn out, the home-made cookies, lemonade and cookies were greatly appreciated, as was the music by Bing and the Band! As for the serious business at hand, we raised a huge red balloon up to the height of a 15-storey tower (pictures to follow), and the petition signature table saw great business. 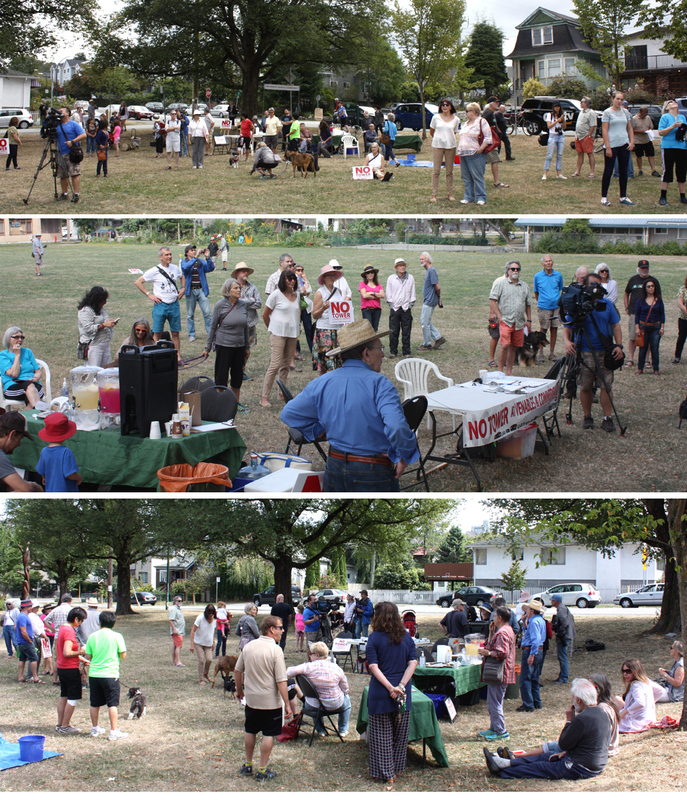 Many thanks to the many residents of our wonderful neighbourhood who showed up to confirm their support for development at Commercial & Venables that does not involve a tower. Lots of dogs, lots of kids, lots of community; great fun! Posted in Events on August 16, 2015 by pennystreet546. Posted in Events, Image format on August 15, 2015 by pennystreet546. Thank you for our positive conversation of today, regarding inappropriately placed signs for the NO TOWER Coalition. We are making every effort to communicate to our supporters and ensure they comply with city regulations as you have outlined them. Today we sent the following message to our supporter list and are posting it to our web site. “If you do have a lawn sign or are planning to put one up, please ensure that it is not placed on city boulevards (defined as the space between the sidewalk and the street) or on street centre medians, lamp posts, utility poles, street furniture or any other area of city property, including the centre of Boundary Road. Signs may be placed on private property, defined as the space between a house or apartment and the sidewalk. Bylaw infringement carries a possible charge of $100 – $300. Today we spoke to city officials and assured them we will do everything we can to comply with the bylaw and will co-operate fully with the city in this regard. The city has said they will return the confiscated signs to us, and they are grateful for our support and co-operation. Please help us comply with city regulations! If you observe any of our sign illegally or inappropriately placed, please let us know by posting a note, with the location, to novenablestower@shaw.ca and we will take immediate action. We also very much appreciate the fact that your inspector will inform us of any known violations, so we can take immediate action. Posted in Correspondence on August 14, 2015 by pennystreet546. 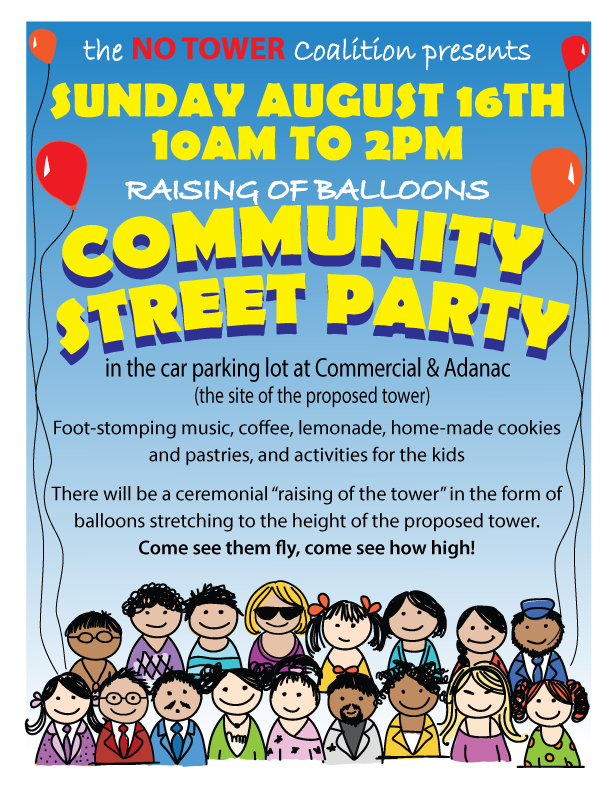 It’s Time For A Street Party! Posted in Events, Image format on August 4, 2015 by pennystreet546.